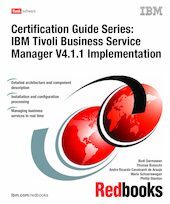 This IBM® Redbooks® publication is a study guide for the IBM Tivoli® Business Service Manager V4.1.1 certification test. It is aimed at IT professionals who want to be an IBM Certified Professional for this product. The IBM Tivoli Business Service Manager V4.1.1 implementation test is offered through the IBM Professional Certification program. It is designed to validate the skills required of technical professionals who work in the implementation and deployment of IBM Tivoli Business Service Manager V4.1.1. This book provides the necessary information for understanding the subject matter. It includes sample questions that will help evaluate personal progress. It familiarizes the readers with the types of questions that may be encountered in the exam. This guide does not replace practical experience and is not designed to be a stand-alone guide for the subject. Instead, this guide should be combined with educational activities and experiences and used as a very useful preparation guide for exam. For your convenience, the chapters are based on the certification objectives of the IBM Tivoli Business Service Manager V4.1.1 implementation certification test. Those requirements are planning, prerequisites, installation, configuration, administration, problem determination. Studying each chapter helps you prepare for the objectives of the exam.